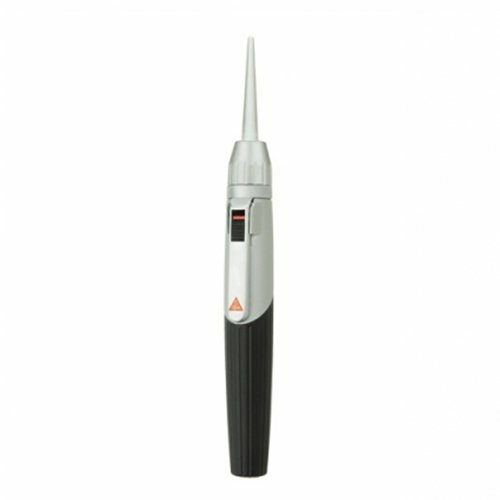 The Mini-C Clip Lamp with Ear Light is a professional pocket diagnostic light, designed exclusively for lighting of the transition area from the auricle (external ear) to the external acoustic meatus (ear canal). Used by hearing aid specialists or suitably trained personnel, it is a device for the anatomical adjustment of the geometry of hearing aids. It outputs bright, concentrated light thanks to the novel XHL Xenon Halogen Lens bulb, facilitating adjustments. The shockproof handle is made from refined plastic with a non-slip surface, and is ergonomically designed to sit comfortably in the hand. The on/off switch is integrated neatly into the attachment clip and the light switches off automatically when replaced in the practitioner\’s pocket. The Mini-C has an attractive, chrome finish (upper section) and is available with a choice of black or blue coloured handle.